the country especially the Visayas region last November 8, 2013. 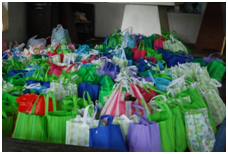 It was indeed a joy to see the delight in the eyes of the victims when they received their bags of goods. The School Director and Concurrent College Dean, Dr. Rosario J. de Guzman, crowned the blessed Virgin Mary during the grand rosary rally held at the eve of the disastrous typhoon, Yolanda last November 7, 2014 at the school quadrangle. The said event was participated in by the faculty, staff and students of Silay Institute, and the ADEC staff and officers. The Brothers of the MARIAN MISSIONARY of the HOLY CROSS (MMHC) facilitated the said celebration in cooperation with the former Youth Marian Crusade (YMC) animators, Ms. Maria Teresa dela Cura and Mrs. Lelaine Arandes. Student offered fresh flowers and employees enjoyed the praise and worship songs despite the heavy rain brought by the approaching typhoon, Yolanda.